Carded production samples were created primarily to gauge the appeal of the figure in its final packaging. As is evident from the blister's squared-off bottom corners, this Rancor Keeper figure has been mounted on a proof card, an attribute which by itself makes the piece interesting. What makes this item truly cool, however, is that it features a very early injection-molded example of the Rancor Keeper figure. By the tail-end of the Star Wars era, Kenner is thought to have begun creating some first shots in-house rather than leaving them exclusively in the hands of overseas vendors. In doing so, they employed cheap, short-term aluminum molds, into which a milky-white, rather low-quality plastic was typically injected. 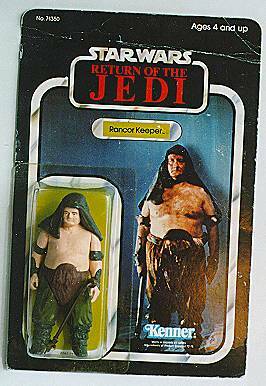 I believe this Rancor Keeper to be one such figure. It features a greater degree of detail than later production figures, and displays a hint of white plastic material, visible in several areas just below the figure's hand-painted surface.